It was speculated and now confirmed that tonight in Winnipeg Charlie Coyle will be playing center for the first time this season. 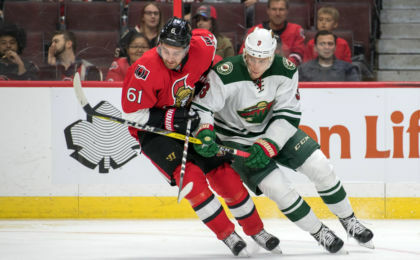 The move comes as the Wild look to size up their squad heading into the deadline and place Coyle in the place where he can best contribute to the team right now. Michael Russo of the Star Tribune is announcing that Charlie Coyle will play his first game at center this season for the Minnesota Wild. 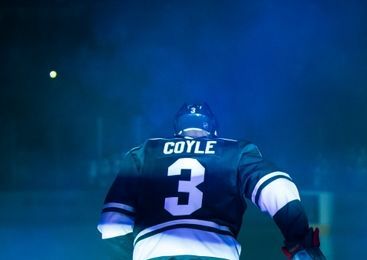 Coyle was thriving on the wing early in the season playing up on the Wild’s top line with Eric Staal, but as of late Coyle has cooled down and looks to be struggling to find his scoring touch. The thought was that Head Coach Bruce Boudreau would be looking to find a way to help Coyle out of his 13-game goal drought so this moves largely comes as no surprise. The idea that Coyle could be sparked by a move back to his old position up the middle is interesting. The idea last season was to let him concentrate on scoring by moving to the wing, and it seemed to work out well to for most of the season. However, just like he did the season before, when he was at center, Coyle fell apart at the end of the season with much lower production. So is a move back to center going to help Coyle breakout of his scoring funk? The short answer is probably no. 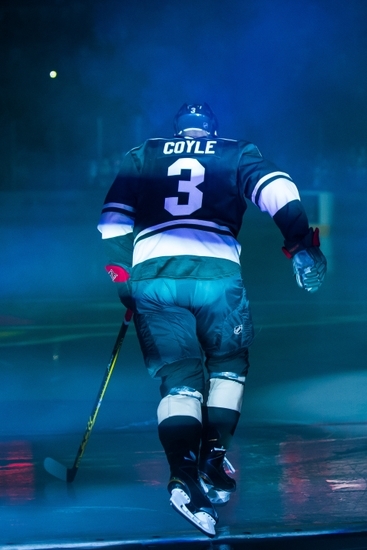 In his last full season at center in 2014-15 Coyle racked up 35 points (11 goals 24 assists) in a full 82 game season. And thus far 51 games into this season, where he’s played nothing but wing, Coyle has notched 38 points (13 goals and 25 assists) which is obviously more points at wing and we’re not even done with the season. Sure maturity might account for a few points, but indications are that Coyle is a better scorer playing the wing. 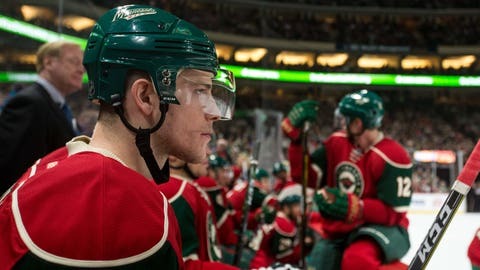 But is that what the Wild need from Coyle? The Wild have gotten increased scoring across the board as plenty of other players are pitching in on the scoreboard. Nine Wild players are currently over the 10 goal mark, and the team is currently 4th in the NHL in goals for. So, scoring is not really a concern like it has been in the past and therefore the Wild really don’t necessarily need Coyle to heat up in the goal department. The Wild however have creeped up a bit in goals against, and all indications are that the higher scoring Wild means a bit less of a defensive Wild. 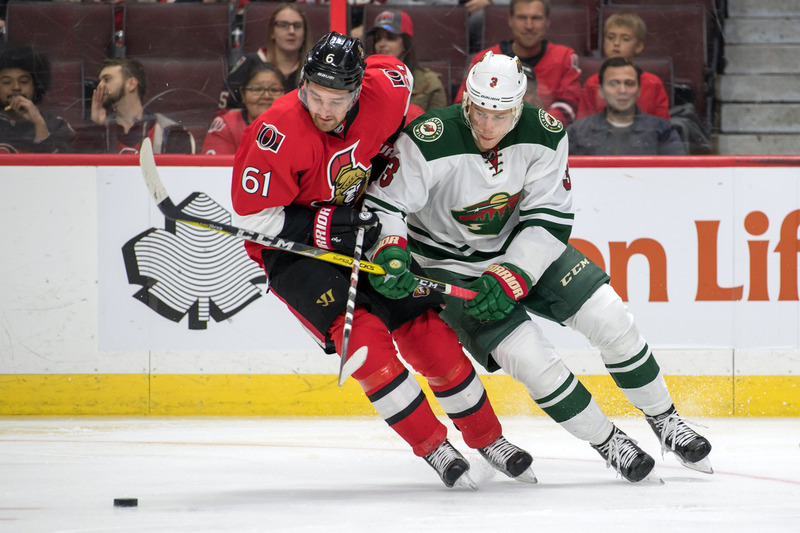 So could moving Coyle be about strengthening the Wild defense? Maybe as the last full-season Coyle played center he was +13 with a 50.4% Corsi and 51.9% Fenwick, showing that when he plays center he’s playing a strong and complete two-way game. That’s a great strategy and one that will serve the Wild very well going into the trade deadline. In past seasons the need to win and to win now have hampered the Wild from experimenting too much to like this before the trade deadline. Now with a more scientific approach the Wild can see exactly where the team is at and what it needs personnel wise…if anything. Bottom line with Coyle though is I think the change of scenery will at least get him to start to think about his game a bit more. Also the ability to play with players he wouldn’t be able to play with might be the key. And the ability to let someone else get the scoring pressure put on them could be huge while Coyle is in this can’t buy a goal slump. He’ll be able to contribute in other ways by design and that’s what good coaches do, help their players contribute the best they can based on their skill set and/or current ups and downs.